Italian-born and trained, Girolamo Nerli brought the influence of the Macchiaioli plein-air group to Australian painters, including Conder, Streeton and Roberts. Like the French Impressionists, the Macchiaioli were concerned with the portrayal of light – but they were more interested in conveying a metaphysical intensity rather than light’s momentary effects. 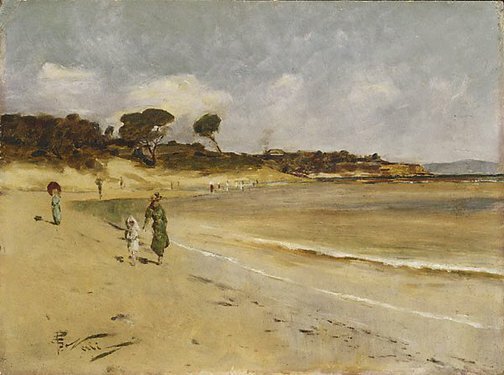 This scene depicts Sandringham beach on Port Phillip Bay near Melbourne, and shows Nerli’s preference for rapidly sketched atmospheric effects in muted tones, with small contrasting touches of brightness. The figures strolling along the shore are important compositional accents to an otherwise sparingly delineated coastal landscape. Signed l.l. corner, brown oil "GP [monogram]. Nerli". Not dated. Charles Conder , Melbourne, 1972, (illus.). Girolamo Pieri Nerli (1863-1926) , Melbourne, 1976, 18, 19, 30, 33, (illus. ).